May | 2014 | And Baby B Makes Three! I sat and pondered that for a few minutes, and the more I thought about it, the more I really liked it. Isn’t that what we try to do in life — experience things, see new places, spend time with friends and family, all in the name of having fun and making memories? I think that’s why it’s a little frustrating that I’m unable to keep up the blog as much as I want to lately. I’m doing my best to make memories with my family — and I think I’m doing a good job — but the fact remains that the human memory fails us over time. What once was at the forefront of the mind gradually takes a backseat…then slowly becomes less fresh and vivid until it’s but an echoed whisper from a life lived long ago. So over the past several years, I’ve come to rely on my blog as backup storage, if you will, to my fallible human memory hard drive. Without that backup, stories that were once notable or cherished sometimes vanish without notice. Thus, the printed word is the remedy to that ailment. But, how to solve the problem of such limited time? I’m not quite sure about that one. Everyone is busy — it’s not something unique to me, of course, and everyone has to find a way to juggle their priorities. I used to make blog posts quite regularly in the past, though in fairness, I would work on those posts during my downtime at work, and I simply don’t have that downtime anymore at my current job. (Most days I don’t even have the time to take a lunch break. Such is life on a daily newspaper deadline.) But the bottom line is that I need to figure out a way to make it happen, since recording our families stories, milestones, and achievements is something I find important. I’m doing a good job of acquiring the memories — going to the zoo, going out for ice cream, playing board games, planting flowers, and more — but what good are the memories if I don’t retain them? *The Big Sis lost tooth #6 (lower right lateral incisor) on April 22. This permanent tooth is going to be met with quite a bit of crowding and most likely won’t be coming in straight at all. Like The Husband and me both, she has quite a small mouth, so we will likely be headed to The Orthodontist at some point. I got lucky, however, and never did need braces (though you’d never think that if you saw my mouth when I was a kid). *The Big Sis had a fundraiser, Jump Rope for Heart, for the American Heart Association at school recently, where she raised $405. And guess what? That ended up being enough to make her the leading fundraiser at her school, which I could tell made her so proud. She did a little movie where she was jump-roping and asking for donations, and I posted that on my Facebook page, so she really did help with the effort. A huge thank you if you were one of those friends or family members that donated! 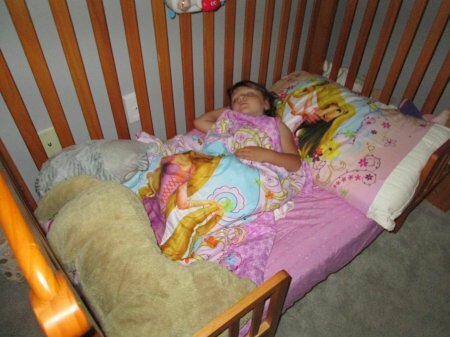 *I think we’re on the verge of converting The Little Sis’s crib to a toddler bed. 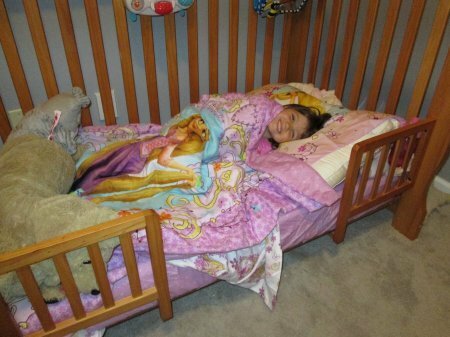 For the past week or two, she’s been asking to go to sleep on the futon in her room, which we’ve been letting her do, then we move her to the crib before we go to bed. Last night we let her sleep on the futon for the entire night and she did well; I think this is a good way to ease her (and us) into the freedom of a toddler bed. *I’m heading to NYC this time next month, and I am crazy-obsessed-over-the-top excited. In a couple of different passages in “A Tree Grows in Brooklyn,” Francie reflects on experiencing something for the last time, a feeling that we all know too well. The last time of anything has the poignancy of death itself. This that I see now, she thought, to see no more this way. Oh, the last time how clearly you see everything; as though a magnifying light had been turned on it. And you grieve because you hadn’t held it tighter when you had it every day. In “A Tree Grows in Brooklyn,” Francie’s grandmother has some sage advice as she nears the end of her life. In “A Tree Grows in Brooklyn,” our protagonist, Francie, makes a time capsule of sorts on the eve of World War I. She includes such things as a lock of her hair, a piece of paper with her fingerprints and lipstick mark, and a poem she liked. I really enjoyed reading her “seize the day” philosophy here. Frances Nolan, age 15 years and 4 months. April 6, 1917. She thought: “If I open this envelope fifty years from now, I will be again as I am now and there will be no being old for me. There’s a long, long time yet before fifty years…millions of hours of time. But one hour has gone already since I sat here…one hour less to live…one hour gone away from all the hours of my life. “Dear God,” she prayed, “let me be something every minute of every hour of my life. Let me be gay; let me be sad. Let me be cold; let me be warm. Let me be hungry…have too much to eat. Let me be ragged or well dressed. Let me be sincere — be deceitful. Let me be truthful; let me be a liar. Let me be honorable and let me sin. Only let me be something every blessed minute. And when I sleep, let me dream all the time so that not one little piece of living is ever lost. The passage below (from “A Tree Grows in Brooklyn”) is just as relevant today as it was when it was written, as the so-called “mommy wars” are just as vicious as ever. Instead of offering love and support to each other as we go through the trials of motherhood, women often do just the opposite, proclaiming their way as the only right way to do things, and anyone who would veer from that doesn’t know what they’re doing. It’s a shame that we can’t accept other people’s choices as being their own and acknowledge that just because they’re different from what we choose doesn’t mean that it makes it wrong. It’s just not right for us. Most women had the one thing in common: They had great pain when they gave birth to their children. This should make a bond that held them all together; it should make them love and protect each other against the man-world. But it was not so. It seemed like their great birth pains shrank their hearts and their souls. They stuck together for only one thing: to trample on some other woman…whether it was by throwing stones or by mean gossip. It was the only kind of loyalty they seemed to have. I love this passage from “A Tree Grows in Brooklyn” because I think it captures the wonder and excitement of the milestone of reading. Reading has been such an important part of my life, and I know sometimes I take the ability to read for granted — it’s just something I do. But it’s a learned skill, and not something that everyone in the world has the education to do. But it’s true that the whole world opens up for eager readers. Oh, magic hour when a child first knows it can read printed words! For quite a while, Francie had been spelling out letters, sounding them and then putting the sounds together to mean a word. But one day, she looked at a page and the word “mouse” had instantaneous meaning. She looked at the word, and the picture of a gray mouse scampered through her mind. She looked further and when she saw “horse,” she heard him pawing the ground and saw the sun glint on his glossy coat. The word “running” hit her suddenly and she breathed hard as though running herself. The barrier between the individual sound of each letter and the whole meaning of the word was removed and the printed word meant a thing at one quick glance. She read a few pages rapidly and almost became ill with excitement. She wanted to shout it out. She could read! She could read! “And you must tell the child the legends I told you — as my mother told them to me and her mother to her. You must tell the fairy tales of the old country. You must tell of those not of the earth who live forever in the hearts of people — fairies, elves, dwarves, and such. You must tell of the great ghosts that haunted your father’s people and of the evil eye which a hex put on your aunt. You must teach the child of the signs that come to the women of our family when there is trouble and death to be. And the child must believe in the Lord God and Jesus, His Only Son.” She crossed herself. Ugh, I haven’t posted for a while, and it’s not for lack of things to say/record, but I just can’t seem to make the time to sit down and do it. Life is go-go-go, and when I finally have half an hour to sit down at the end of the night, I just want to do nothing but veg. And truthfully, I’ve been struggling of late, with work insanely busy, limited time with friends/family, medical problems for The Husband, everything kid-related a battle — I just don’t have enough left to do much else at the end of the night. My spirit withers day by day as fatigue compounds, and I need to find a way to wrest control of it again. One thing I’ve been doing this year, though, is making time for reading. I love to read — heck, I made reading into a career. However, because I do it all day, every day at work, my desire to do it in my free time is lacking. And, again, usually once I crawl into bed, all I want to do is just go to sleep. But I decided it’s worth my while to give myself that half an hour every night to escape to other people’s stories, and maybe it would help me deal with the current stresses in my life. Recently I wanted something different and ran across “A Tree Grows in Brooklyn” among the library’s Kindle offerings. I’m not sure why, as I knew nothing about the book, but I’ve wanted to read that book for a long time now. Something about the title always drew me in. So, I figured, why not? It turns out that I really enjoyed the book. It’s not the sort of book you seek if you’re looking for fast-moving plot, but if you’re more in the mood for character development, then it’s up your alley. I finished the book last night, and I was sad to leave Francie Nolan behind, sort of wondering the details of what happens to her after the book is finished. I’ve never felt the need to highlight passages in previous Kindle books I’ve read, but I ran across several that I liked in “A Tree Grows in Brooklyn.” Just for my own purposes, I’m going to copy some of them here this week so I have them all in one place. Maybe it’ll be a little project that will get me back on track with writing more often. You are currently browsing the And Baby B Makes Three! blog archives for May, 2014.